One sure sign that a tree has been planted too deep is if it is displaying girdling roots. These roots can appear both around the trunk of the tree that is being affected, as well as around other nearby trees. 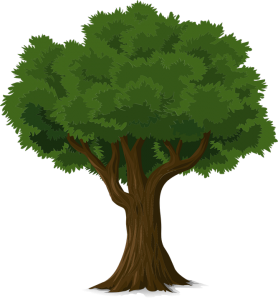 Another sign that your tree may be planted too deep is if its leaves or stems are darkened and/or wilting. If the branches are dying or dead, that’s another sign. If the tree is extremely young, look to see if it appears as if the trunk has been planted “too” straight. If it seems similar to a pole that has been placed into the ground without any roots showing, this is a major warning sign that it has been planted too deep. A tree that has been planted too deep is a major issue because it means that its roots will not be growing properly. For example, if it develops girdling roots as a result, the lack of space for the roots to grow means that the tree will suffer from malnutrition through a lack of adequate amounts of water and nutrients that the roots can absorb form the soil. This will lead to the tree slowly dying, hence the darkened leaves or stems. 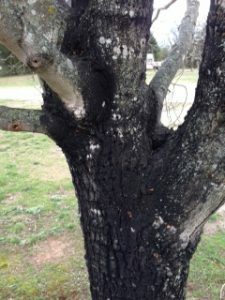 The problem will only get worse as the tree continues to grow older, since there will be a continued buildup of stress on the tree, and it will be limited in the oxygen and water that it obtains. This is not to mention the fact that it will become more susceptible to insects, diseases, and any extreme weather. If your tree is planted too deep, it can be fixed, but the difficulty of doing so depends on its age. If it’s a young tree that has only been planted between two to three months, it might be able to be reset relatively easily. If it’s a much older tree, you will most certainly have to contact a professional arborist in order to remove it and replant it the correct way. A professional arborist will also be needed to examine the best course of action to ensure the survival of the tree. This could involve either having a root excavation or vertical mulching performed. In some cases, both might be necessary to save it and to permanently fix the problem. Lewis Tree Service has close to 30 years of experience fixing trees that have been planted too deep in the Santa Cruz and Monterey areas. Make sure to contact us today for a free quote and to have one of our ISA certified arborists sent to help you!